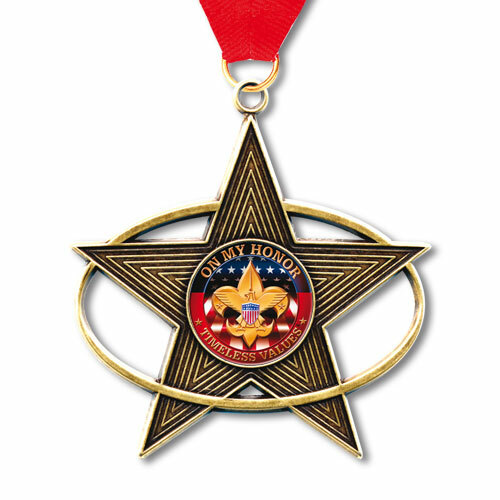 A 3-inch medal in the shape of a star, with a full-color custom emblem in the middle. Each custom emblem includes an epoxy dome. These medals can be shipped in 1 week or less, perfect for last-minute planning. Unlimited colors are included with your custom emblem. 1 week after art approval. An epoxy dome is included with your custom emblem. Die Cast, Die Struck, and Color Magic medals are available with a wide array of ribbon choices. Below you will find the standard sizes and colors of ribbons available on-demand. We can also custom-make uniquely colored and imprinted ribbons on request. Colors are not exact and may vary, due to the way different monitors display colors. Additional colors, and custom-made ribbons are available on request.